Terrorists | Hayat Alvi, Ph.D.
We are waiting for “it”: the explanation, the reasons, the motive; the analysis of the sinister minds that decided to live for years in the U.S., and then turned against their benefactor with fierce, heartless, cold-blooded lethality. It has been a horrible week for us, and even tenser and tremendously sad for those of us who live in New England, where the Boston bombings and subsequent massive manhunt hit close to home. It has been heartbreaking to see images of the once full of life victims who died, and those who are maimed for life. We held our breaths with each breaking news story hoping that the perpetrators were caught. We have been vigilant and anxious at the same time. There are so many tragedies and crimes layered into these events, it is increasingly hard to fathom. The greatest crimes, of course, were the indiscriminate killings and injuring of innocent athletes and spectators. Also, the two brothers thoughtlessly and recklessly sucked their families, loved ones, and ethnic and religious compatriots into a seemingly undeserved vortex of guilt, shame, humiliation, anger, frustration, and disrepute; not to mention fear of repercussions, backlash, bigotry, and prejudice. Marked for life, and branded by association. Yet another crime the brothers so shamelessly committed was to the world of refugees and immigrants. They came to the United States as refugees seeking asylum. They were granted asylum. They lived the greatest dream, one that so many millions in the world would do anything for to trade places with them: the prime education opportunities afforded to them; the athletic skills they attained and enjoyed; the diversity of friends that the U.S., and especially Boston, offers; a fantastic geographic location to reside in; a comfortable life in the land of the free, with no wars or conflicts to flee from. Yet they chose to bring mayhem, violence, and terrorism to Boston. They chose to let all of these superb opportunities slip through their fingers. They chose to turn against their fellow Americans and the country that embraced them with open arms. They chose to stab us all in the heart. During the manhunt last week, the brothers’ uncle, Ruslan Tsarni, was eloquent and passionate in his anger and condemnation of his estranged nephews. He understood what a loss the boys engendered in so many dimensions, and he understood the magnitude of the tragedies, and the wasted youth and opportunities they so callously tossed away. He understands and appreciates the blessings of being in America and being an American. So much has been lost, thanks to the two brothers. Hayat Alvi, Ph.D., is an Associate Professor in the National Security Affairs Department at the US Naval War College. The views expressed are personal. It’s amazing that some people protested against the French-led campaign in Mali. Surely the French have a host of national interests in doing so, including sustaining ties to its former colony. No one is naïve enough to believe that it was done out of true altruism. But at the same time, given what the Sharia bullies who ransacked their way through northern Mali and threatened the capital had done to the locals, the French should be applauded. 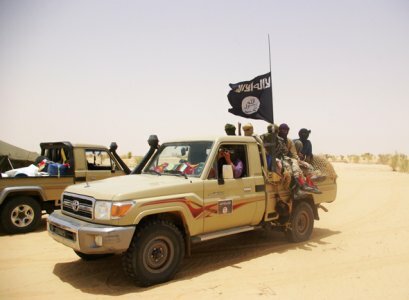 Tuareg rebels who had long been Libyan leader Colonel Qaddafi’s allies grabbed their weapons and fled to Niger and Mali in 2011 after their benefactor’s demise. Together with Islamist extremists, they overran the Malian military, and the hard-line Al Qaeda in the Islamic Maghreb (AQIM) affiliated Islamists implemented harsh Sharia laws particularly restricting women. They demanded women to cover up and not be in public without a male chaperone, and to cardboard windows in their homes. They even turned against their Tuareg comrades and violently drove out anyone among the Tuareg rebels who didn’t join them. Islamist extremists meted out extrajudicial executions, stonings, whippings, amputations, and other forms of violent punishments with no due process. A man amputated his brother’s hand; a couple was stoned to death for “adultery;” and countless people have been whipped, humiliated, and bullied in public by bearded Taliban-like extremists alongside Kalashnikov-wielding adolescents. Hundreds of thousands of Malians have fled as refugees. The refugees say that they fear the extremists, and economic activities are at a complete standstill thanks to the extremist thugs. A humanitarian disaster has ensued. In addition to their brutal treatment of fellow moderate Muslims, the extremists have destroyed centuries-old UNESCO heritage sites, including mosques and important Sufi mausoleums in Timbuktu, and they have burned irreplaceable old manuscripts in historical libraries. “Adolescents wielding Kalashnikovs stand at the barrier with their legs apart. The oldest one keeps repeating the same instructions through a megaphone: ‘No cigarettes, no CDs, no radios, no cameras, no jewelry,’ an endless loop of prohibitions, a list of everything that’s haram, or impure, with which this journey to the north begins. The men stand guard in the name of the Prophet Muhammad. … The Sharia court uses a former military base outside the city to carry out its grisly punishments. 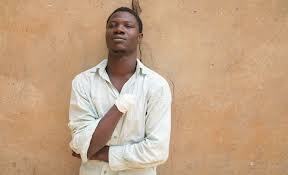 One of its victims is Alhassane Boncana Maiga, who was found guilty of stealing cattle. Four guards drag Maiga, wearing a white robe, into a dark room and tie him to a chair, leaving only one hand free. A doctor gives the victim an injection for the pain. A few days later Maiga died, possibly from infection. “Islamic police in pickup trucks patrol the streets. The market is closed, and women are no longer permitted to go out in public alone in the city. The men were instructed to grow beards. Those who do not obey the muezzin’s call to prayer are either whipped or jailed for three days. Listening to the radio is banned, and the new rulers have simply sawed off satellite dishes on the roofs of houses. … “Those stupid Salafists,” [says a Kidal resident]. He refuses to take them very seriously and isn’t fooled by their piety. He calls them bandits, not holy warriors. 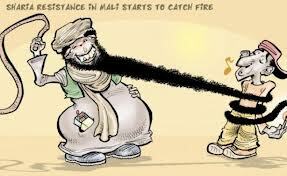 Those who so vocally espouse the brand of Sharia that the Mali terrorists wield should spend a day under their ruthless rule. Then let’s see who will be crying for someone to rescue them.